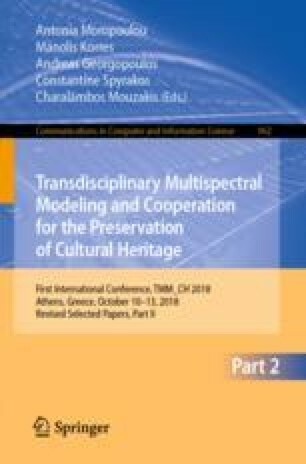 One of the goals of the INCEPTION project, funded by the EC within the Programme H2020, is to explore and enhance H-BIM knowledge management in the sector of Cultural Heritage (CH), taking into account the richness of the interdisciplinary documentation associated with the different significances of the assets. Architectural and historical documents, structural analysis, building material characterisation and other sourced documentation for a H-BIM virtual model of a built space can be of different formats, scopes and significances but their organisation, sharing and findability are crucial for the holistic e-documentation that can be enriched from interdisciplinary users and reused for different purposes. Conceptual frameworks of a document management system interoperable with H-BIM should guarantee an easy way to organise digital documents from variable sources and associate them to specific parts of the buildings. This to avoid overwhelming information and to allow the user to explore the virtual model with the best granularity. Within the INCEPTION project, a layered and interoperable H-BIM ontology has been developed to gather and store new information from the original BIM model and CH information, as well as to associate the correct architectural element to each structural or decorative part of the building. Then the H-BIM ontology has been extended implementing a specific addition to create an association between external documentation and the whole 3D model or individual elements specified in the H-BIM graph. This paper explains how the Semantic Web technologies allow retrieving and filtering the holistic documentation by the user needs and using it in the 3D model exploration and analysis, improving the user experience and the findability of different knowledge sources. The project is under development by a consortium of fourteen partners from ten European countries led by the Department of Architecture of the University of Ferrara. Academic partners of the Consortium, in addition to the Department of Architecture of the University of Ferrara, include the University of Ljubljana (Slovenia), the National Technical University of Athens (Greece), the Cyprus University of Technology (Cyprus), the University of Zagreb (Croatia), the research centers Consorzio Futuro in Ricerca (Italy) and Cartif (Spain). The clustering of small medium enterprises includes: DEMO Consultants BV (The Netherlands), 3L Architects (Germany), Nemoris (Italy), RDF (Bulgaria), 13BIS Consulting (France), Z + F (Germany), Vision and Business Consultants (Greece). This research project has received funding from the European Union’s H2020 Framework Programme for research and innovation under Grant agreement no 665220.